The seemingly simple fixture that runs along the edge of your roof is tasked with a most important responsibility. Read on to learn why gutters are so essential—and how you can make sure yours do the best job possible. Those new to homeownership and home maintenance may question whether gutters are an absolutely vital component of their homes’ exteriors, or just some sort of decorative element. While it’s true that professionally installed gutters create a crisp, clean edge around your home’s roofline, their main purpose is far from mere adornment. Contractors install a gutter system on every new house they build because its job—guiding rain and storm water off the roof and away from the foundation of the house—is essential to the home’s structural well-being. That is, when the gutter is kept clean and free from debris. A Little Water Never Hurt Anyone, Did It? No matter how gently rain falls onto your roof, the water builds up as it runs off and creates a powerful surge that, if not diverted, can hammer the ground next to your foundation—and water and foundations do not mix. Pounding water along the foundation line erodes the soil and can seep down along the foundation, increasing the risk of basement leaks and structural instability. When you fail to clean your gutter system you’re inviting problems, because clogged gutters can be nearly as bad as having no gutters at all. Rainwater trapped in a clogged gutter or downspout has nowhere to go but over the edge of the trough, rendering your gutter system virtually useless. And if the leaves, twigs, and other debris remain during winter, snowmelt can pool and refreeze in the gutters, potentially weighing them down so much that they can pull free from the house. Clogged gutters also increase the risk of ice dams forming at the edge of the roof. A third option, however, can save you from ever having to worry about your gutters again. Instead of performing regular maintenance, you can alter the structure itself: Install a patented seamless gutter system that never clogs and never needs cleaning. 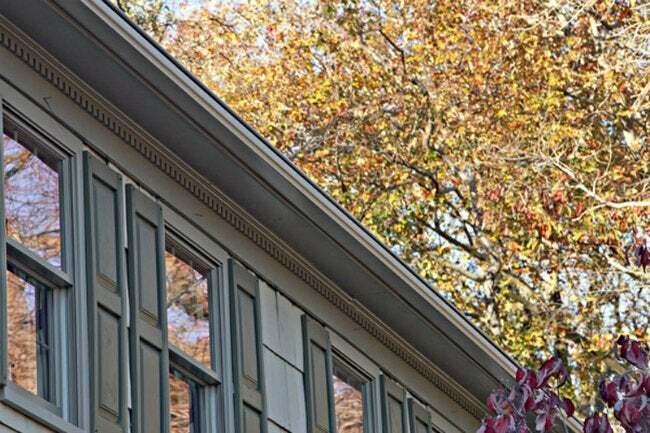 LeafGuard Brand gutters, as the name suggests, combine the funneling functions of the traditional gutter with a patented curved-hood design that shields against leaves, twigs, and other debris. Roll-formed from sheet aluminum, the LeafGuard gutter hood arcs over the top of the gutter, directing runoff from the roof into the gutter while blocking airborne debris from entering. Even leaves that fall onto the roof and are washed off slip right over the edge of the gutter and down to the ground below. The result is a clean, clear gutter that never clogs. This system features an unparalleled durability, which is recognized and backed by the Good Housekeeping Seal. The sheet aluminum used to make LeafGuard gutters is thicker than the aluminum used in traditional gutters, and trained installers secure the gutter with internal hanging brackets for extra stability. Ultimately, all these factors combine to create a system that can handle up to 32 inches of rain per hour—virtually any rain Mother Nature can dish out. 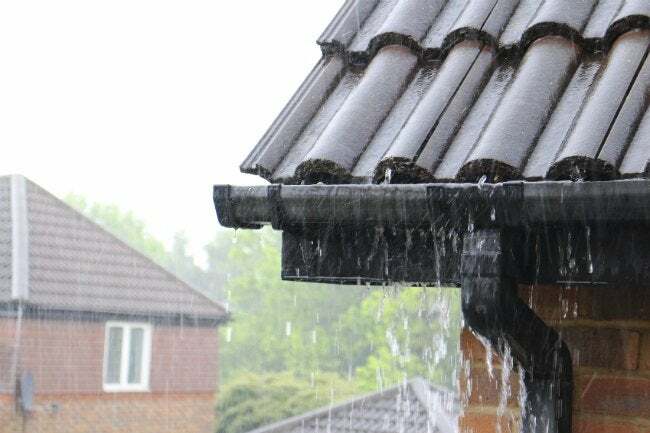 Moreover, the gutter can run from one corner of your house to the next without any seams, thereby eliminating the risk of leaks at connection points. This feat is possible because the entire gutter trough is extruded—right on site—from a single sheet of aluminum to fit your house’s specific dimensions. To top it off, LeafGuard‘s innovative design boasts good looks too. The one-piece construction eliminates unsightly seams, and the gutters come in a variety of colors that can complement, even enhance, your home’s aesthetic appeal. The ScratchGuard paint finish on them comes with a lifetime warranty so that they always look as good as the day they were installed. 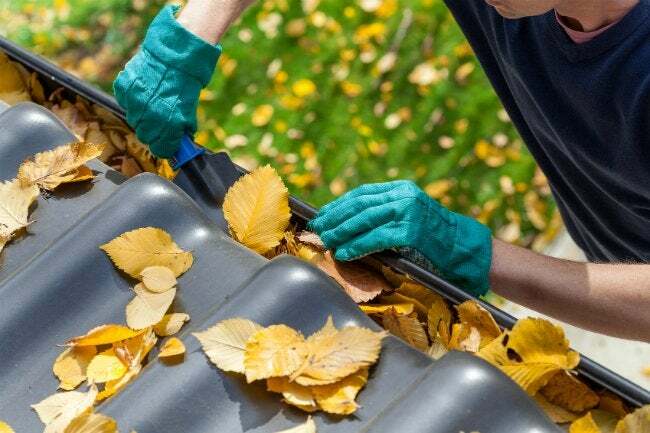 If you’re tired of cleaning your own gutters twice a year, or having to shell out for a professional crew to do it, it’s time to consider the third option of LeafGuard’s cutting-edge gutter technology.